Academy Award Nomination for best art direction and special effects. 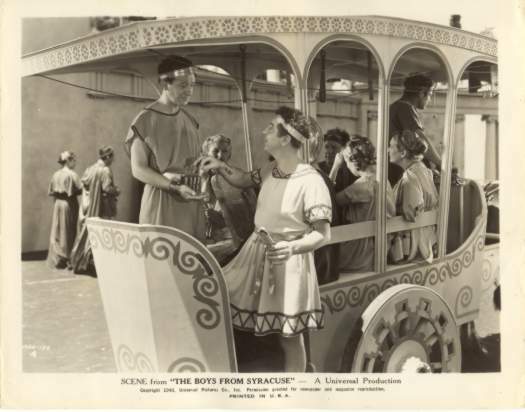 Richard Rodgers and Lorenz Hart's superbly melodic score for their hit The Boys From Syracuse, first presented on Broadway in 1938, received short shrift from producer Jules Levey, whose filmed version of this quintessential tale of mistaken identity (based on Shakespeare' s The Comedy of Errors ) fell just this side of disaster. Numbers like "Sing For Your Supper," "Falling In Love With Love," "He And She" and "This Can't Be Love" - classics every one of them were only included by default, or in truncated versions that failed to do them justice, while new ones (such as "Who Are You?" and "The Greeks Have No Word For It") were added. 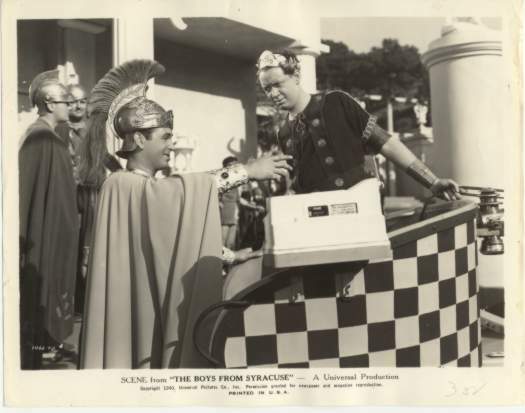 Leonard Spigelgass and Charles Grayson's screenplay (based on the George Abbott stage version) traded in anachronisms at the expense of the satire originally intended, with cigar smoking Greeks and checkered chariot-cabs typical of the humour on offer. 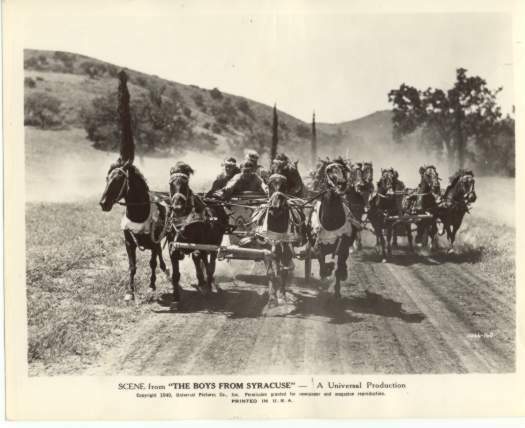 Hollywood, or at least Universal, should be hanged for what it did to the celebrated Broadway show by George Abbott and Rodgers and Hart (based on The Comedy of Errors). The rewriting was so disastrous that the studio finally cut the picture down to 74 minutes, which doesn't leave much time for Martha Raye and Charles Butterworth or for the wonderful songs—"Falling in Love with Love," "Sing for Your Supper" and "This Can't Be Love." 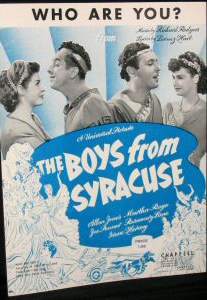 The cast includes Allan Jones, Joe Penner, Rosemary Lane, Irene Hervey, and Alan Mowbray. Directed by Eddie Sutherland; the dance director was Dave Gould.